In 2006 I did a post about Peeps, and the various officially liscenced products that peeps make. I don't really know how these bizarre marshmellow chicks became a part of Easter celebrations over 50 years ago, but here they are lining the shelfs. Today...for reasons I will share in a later post, I HAD to get yellow chicken peeps. At the Easter aisle filled with Easter Basket stuffings there was tons of peeps...green chicks, purple chicks, yellow bunnies, pink bunnies...but the yellow chicks were all gone. I won't lie, I traveled to another store to pick up the peeps I needed. The yellow chicks...and no other color or animal. 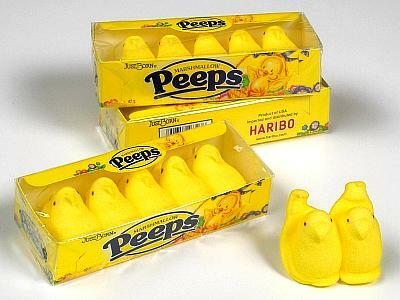 Peeps are evil and must die, perferably by fire, although high explosives will do in a pinch. Alas, the eldrich gelatinous mush composing their bodies is impervious to bullets.